Inspired by the majestic weeping willow tree, the Wild Willows bridal headpiece is a magical piece distinguished by its slender and delicate branch-like design. Carefully handmade from gold or silver wire, it features subtle leaf details, freshwater pearls and life-like flower buds. The Wild Willows infuses a bridal look with natural elements offering a beautifully timeless and sophisticated appeal. While delicate and dainty, this headpiece doesn’t fail to impress and perfectly complements a wide range of exquisitely detailed or minimalist wedding gowns. *LIMITED QUANTITIES – Due to the popularity of the Wild Willows headpiece, we have limited materials available to create this design. If you love this comb, we recommend you secure it before we are no longer able to recreate it. Featuring handcrafted clay flowers, fine mesh leaves, freshwater pearls, Swarovski crystals, Czech seed beads. Measurement: 3.5 cm x 21 cm. The Wild Willows headpiece is ready to ship. Please allow 5-7 business days for your order to be processed plus delivery times. 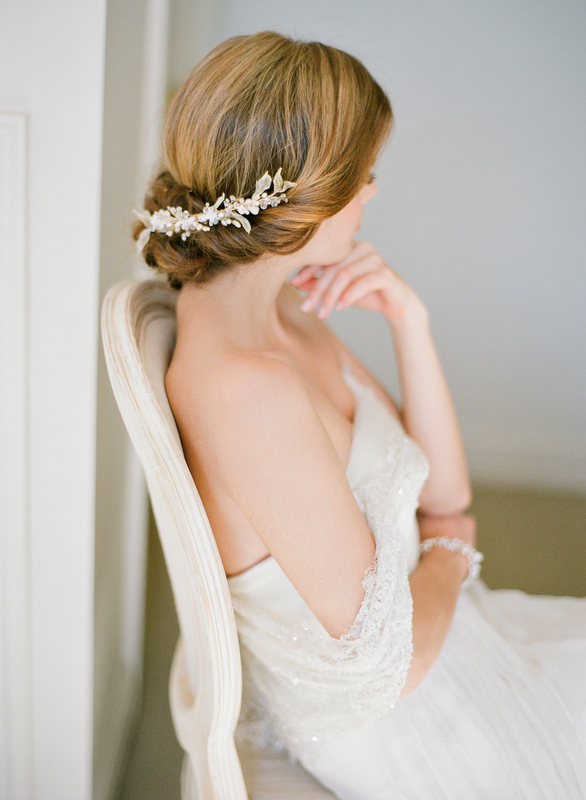 The Wild Willows bridal headpiece is the perfect adornment for a range of bridal updos and down hairstyles. This flexible and versatile piece attaches to the hair with metal hair combs. It can be gently manipulated to the curve of a bridal hairstyle and is designed to be positioned to the side or back of the head. We love it to style it with or without a wedding veil. The distance between the combs on the headpiece allow for a veil’s comb to slot in between seamlessly creating a clean and sophisticated bridal look. Our favourite combination would be a sheer drop veil which hits all the right notes. The Rosella chapel length veil adds a regal touch. For a look that’s a little more relaxed, the Blair fingertip drop would be our styling pick. Browse our full veil collection or contact us and we’d be happy to offer a recommendation to suit the Botanica based on your wedding dress and hairstyle. The Wild Willows’s perfect match is the Lourdes pearl drop earrings. We also love to style it with the Montague, Bella, George or Arlette bridal earrings. Flowers can be changed to other flower styles or colours.